Press release from Bird Aware Solent of which we are a Partner. Walkers, joggers and users of our wonderful Solent coast have all been treated to flocks of fantastic coastal birds over the winter, but unfortunately, all good things must come to an end. As the temperature gets milder, birds that have been a common sight on our shores, such as oystercatcher, ringed plover and curlew, fly off to more northerly destinations such as Scandinavia and Siberia to start their breeding season. The number and variety of coastal birds that visit the Solent is truly impressive. Up to 125,000 birds migrate here every year, each with their own characteristics that make them an important element of our beautiful coastline. This year on the Isle of Wight, we have had good numbers of Sanderling at Ryde and Seaview. Newtown has seen large numbers of brent geese. Turnstones have been regular visitors to Thorness Bay and on the Western Yar, black-tailed godwits, teal and wigeon have frequented habitually. On the mainland, Lepe has received large flocks of turnstones. Hamble-Le-Rice has been a popular place to see brent geese. Lapwings have enjoyed the environment of Fishbourne. Prinstead has been home to swathes of avocet and Warsash has also seen good numbers of black-tailed godwit. Bird Aware Solent raises awareness of the coastal birds that visit here for the winter and the importance of giving them space to feed and rest. The partnership is formed of Solent authorities stretching from the New Forest all the way to Chichester and the north coast of the Isle of Wight. It is also supported by Natural England – the government’s environment adviser, the RSPB, Chichester Harbour Conservancy and Hampshire and Isle of Wight Trust. Together, the partnership employs a team of rangers that work across the region talking to people about the birds and their territories. When the weather has been at its most extreme, heart-warming connections have been made over the array of bird life that reside on the Solent. Councillor Seán Woodward, Chairman of PUSH, the Partnership for Urban South Hampshire, which oversees Bird Aware Solent comments, ‘The birds of the Solent are unique, and we are very lucky that they call our shores home. 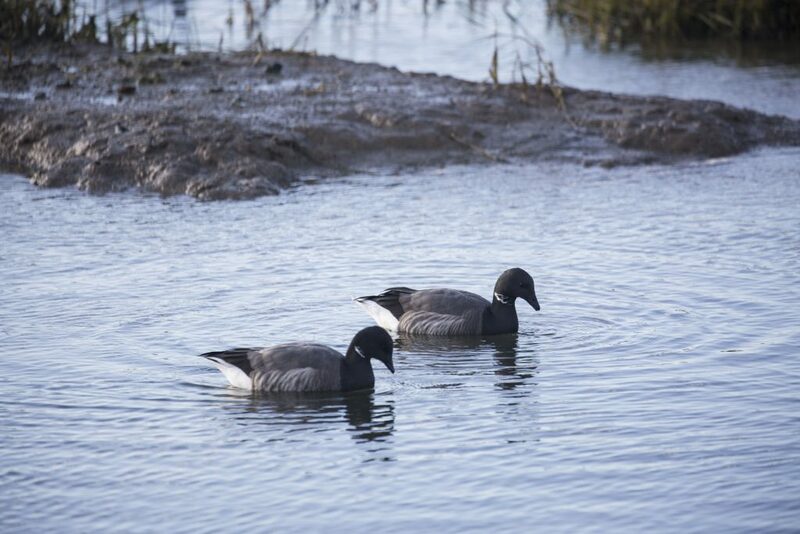 Over 27,000 or 10% of all dark-bellied brent geese travel here every year, so it’s really important that we continue to look after their habitats and take care not to disturb them’.